The sacrifice that our Army Jawans make for our safety is an issue which doesn’t find the attention it really deserves. There are oasis like associations with nation-first sentiments who do their bit to pay back the debt we owe to our Jawans. “Flags of Honor” is one such Organisation in Bangalore which is doing a commendable job to instill the faith amongst Jawans - which “we” too are with them. 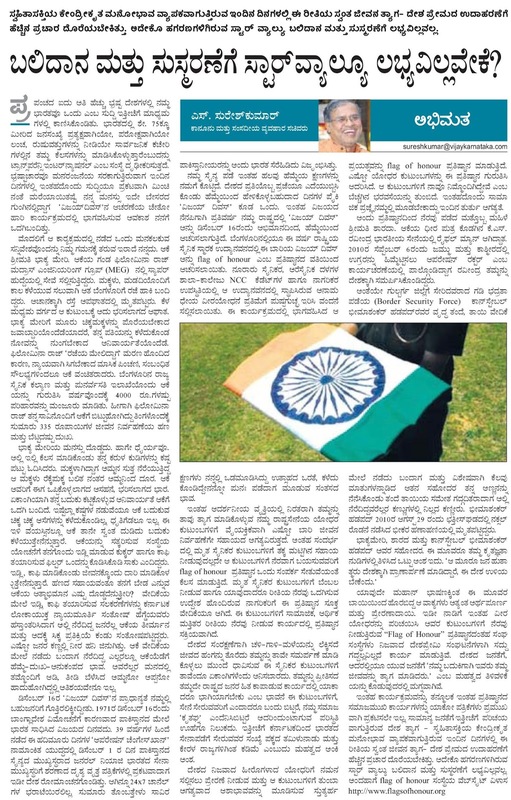 My admirable experience of this year’s Vijay Divas celebrations finds a mention in today’s write up in Vijay Karnataka. Pls do read it. Let’s remember and salute to those who protect us! My sincere suggestion is that state govenrment should not wash of its hands by attending the last rites of the martyrs.The only thing the state governement needs to do is cut the RED TAPE and corruption involved in the settlement of the compensation to the martyrs families. The KARNATAKA state governement has still not disbursed the rewards due to the police who were involved with the "NAB Veerappan" Operation!! What these family of martyrs need is not sympathy or lip service. Can you as a law minister show the guts to take back all the BDA sites alloted to People like Madhu Bangarappa ( Sold the site to 85 lakh rupees just after 8 days of allotment), Priyank Kharge and the police officer who had 46 BDA sites (According to newspapers report following Lokayukta ride about 2 years ago) and distribute to these families.These politicians have submitted false affidavit saying that, they do not own any residential property.For submitting false affidavit, they should be criminally prosecuted. People of Karnataka expect some action, not just words. You command lot of respect in BJP as a honest person. There are lot of expectation to weed out the corruption in Karnataka.As a law minister,please introduce legislation to weed out corruption. Otherwise another article you have written about India as the 5th most corrupt nation sounds like a rambling. Vijay Karnataka is the largest circulated Kannada daily newspaper and published from a number of cities in Karnataka State.Vijay Karnataka offers advertisers the widest choice of its editions in cities: Bangalore, Karnataka, Etc.Book classified and display ad in Vijay Karnataka at lowest price vi amyadvtcorner. EVERYONE MUST KNOW THAT WE HAVE NO PRICE!